For me, the New Year often means two things – healthy eating resolutions and lots of left over turkey. Why not combine them into this tasty Whole30 Turkey Hash? This hearty and healthy breakfast bowl keeps me full until well past lunch time and gives me a great start to the day. It is jam packed with nutritious vegetables and makes great use of my left overs. Whenever I want to jump start my weight loss, I do the Whole30 diet plan. The plan is meant to show you which foods cause inflammation in your body, but it’s also a wonderful way to lose weight. Be sure to check out this list of healthy recipes if you are looking for more options for clean eating and weight loss recipes. You won’t believe how great you feel after getting rid of sugar and processed foods for a month. The weight loss is an extra bonus! One of the great things about the Whole30 diet plan is that proteins and vegetables become the star of your recipes. That means that a heaping bowl of vegetables and lots of left over turkey are just made for each other. There is no counting calories, which I love. Cutting out the processed food and sugar seems to agree with my body and I always lose weight when I follow the plan carefully. Everything except for the cooked egg comes together in one pan in less than 30 minutes. 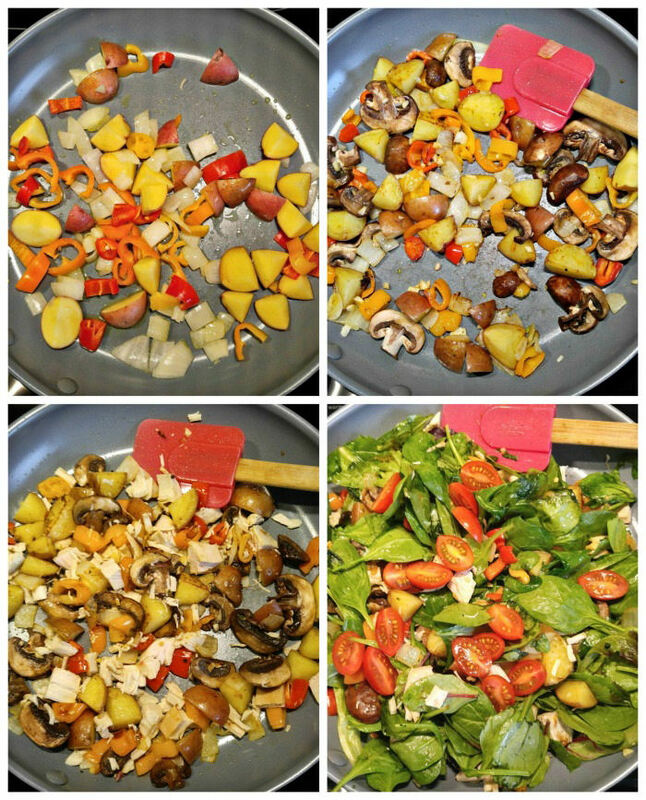 You can use whatever veggies you have on hand but I love baby potatoes and peppers, as well as onions, mushrooms and baby spinach. I’ve also made this with broccoli florets, cauliflower and baby mixed greens and it’s really good, too. When the vegetables are cooked and the greens are almost wilted, I just make a soft cooked egg and add it to to the top. 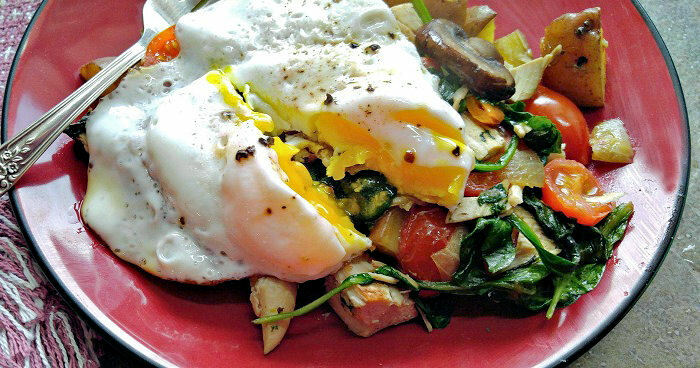 I love the way the soft cooked yolk mixes with all the vegetables under it when I cut into it! Tasting this healthy breakfast bowl. Nutritiously rich are the words that come to mind when I take a bite of this amazing Whole30 breakfast bowl. The potatoes are firmer than the other veggies and add a bit of heartiness to the dish. And the combination of mushrooms, onions and eggs for breakfast in the morning is one of my favorites. See my Whole30 caramelized mushroom breakfast bowl recipe here. It’s another hearty breakfast bowl that fits into the diet plan. I guarantee you that you won’t feel hungry until about 3 in the afternoon after enjoying this yummy breakfast. 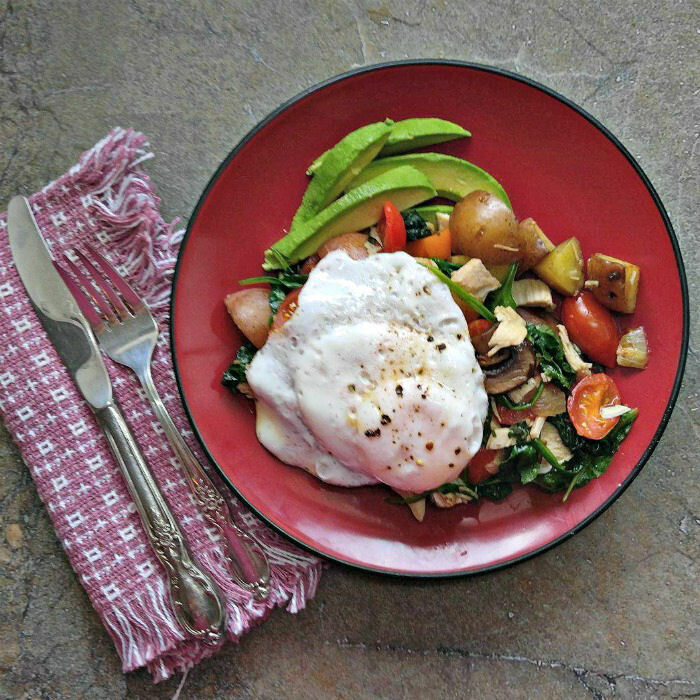 If you liked this Whole30 turkey hash, be sure to also try my breakfast chicken hash. It’s easy to make and super tasty, as well. This breakfast is gluten free and nutritious. If you want it to fit the Paleo eating plan, just sub the potatoes for sweet potatoes and you are good to go! This Whole30 turkey hash is a great way to use left over turkey & makes a hearty & healthy breakfast bowl. Add an egg and sliced avocado for extra goodness. Heat the olive oil in a non stick pan and cook the onions, potatoes and peppers until the potatoes are firm but starting to soften and the onions and peppers are soft, about 6-7 minutes. Stir in the sliced mushrooms and continue cooking another 2-3 minutes. Add the garlic and cooked turkey and heat for another 2-3 minutes until the turkey is nice and hot. Mix in the spinach or baby mixed greens and tomatoes and cook until the greens have wilted - about 2 minutes. Season well with sea salt and cracked black pepper. While the greens are wilting make 2 soft cooked eggs. Spoon the turkey hash onto two small shallow bowls and top each with a soft cooked egg. Garnish the plate with slices of avocado and enjoy.